The new website for The International Committee for Architecture and Museum Techniques (ICAMT) provides information about membership and activities. ICAMT is part of the International Committees of the International Council of Museums (ICOM). 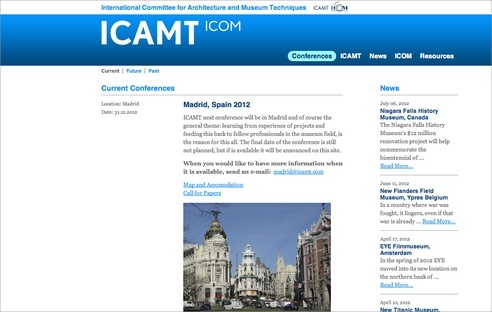 ICAMT's newsletter Brief, annual meetings, working groups and board meetings provide opportunities for members to work together on the field of Architecture and Museum Techniques. This year’s conference will take place in Madrid. The general theme is learning from experience of projects and feeding this back to fellow professionals in the museum field.